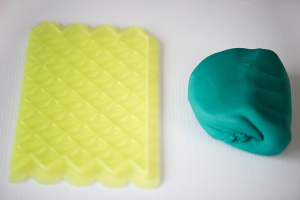 The new collection of Simpress Molds from Marvelous Molds are here!!! And, as we expected, they are another gorgeous must-have set of versatile textural molds. 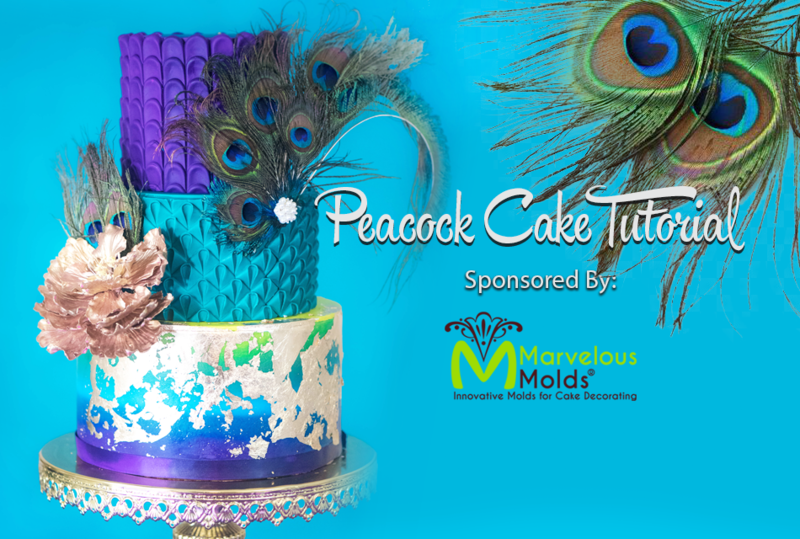 Learn to create a stunning peacock-inspired design with the new Perfect Petal Pattern and Lavish Loops molds with this easy step-by-step tutorial. The latest selection of Simpress molds from Marvelous Molds really showcases some key trends for 2019! 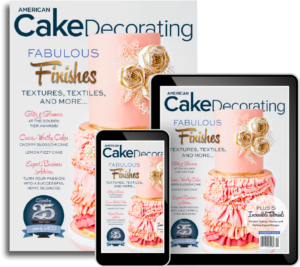 Textural cake designs are becoming increasingly popular for both celebration and wedding cake designs, with ruffles, fabric effects, and buttercream effects reigning supreme. 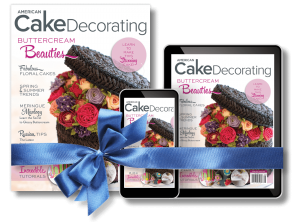 Marvelous Molds have released three exciting new molds in their Simpress line, which allows cake decorators of all abilities to recreate complex and time-consuming effects quickly and easily. 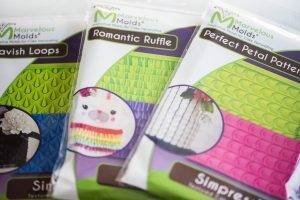 The Romantic Ruffle mold is a ruffled panel that can be applied both vertically and horizontally to cake tiers to create continuous layered ruffles. 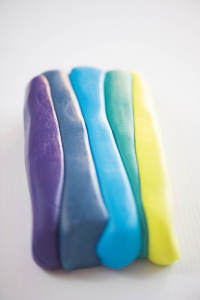 Lavish Loops features a popular looped-fabric effect, that is perfect for modern cake designs and fashion-inspired creations. Lastly, the Perfect Petal mold recreates soft buttercream piped petals, and can be used in a variety of configurations to produce horizontal, vertical, and even angled continuous petals. 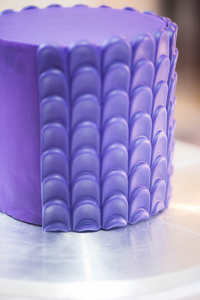 We love the latest collection and can imagine hundreds of uses for these trendy, textured molds. When we received the new collection, we immediately felt that the molds would work beautifully in a peacock-inspired design; 2019 is a big year for color – with spicy pinks, oranges, and purples, and lots of jeweled tones taking center stage. 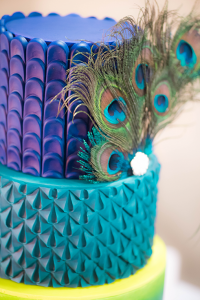 The looped mold mimics the decorative eye in the peacock’s feathers perfectly, and the petal mold, compliments the soft feathery topper, creating a simple, eye-catching, statement cake with lots of texture that is seriously on-trend! 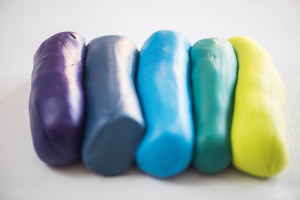 Roll 3 oz of each color into a log shape and place them next to each other going from darkest to lightest as shown. 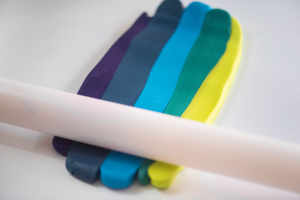 Squish the colors together to elongate the fondant, this way, when the fondant is rolled, the colors will marble together more easily. Begin to gently roll out the fondant, making sure to go in the same direction (back and forth). 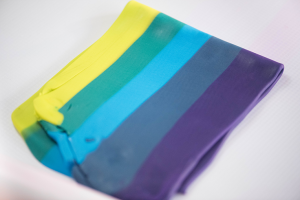 Fold the fondant over on itself as shown, making sure to align the colors. Press the sides together and continue to roll in the same direction. Repeat this process several times. Rebekah notes: Remember to continue to squish the sides of the fondant, so that the finished piece isn’t too wide. 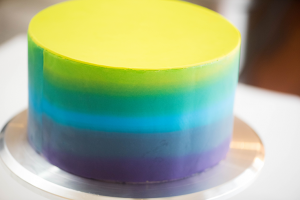 The width of the fondant should be about 5 1/2 inches; wide enough to cover a 5-inch cake tier. 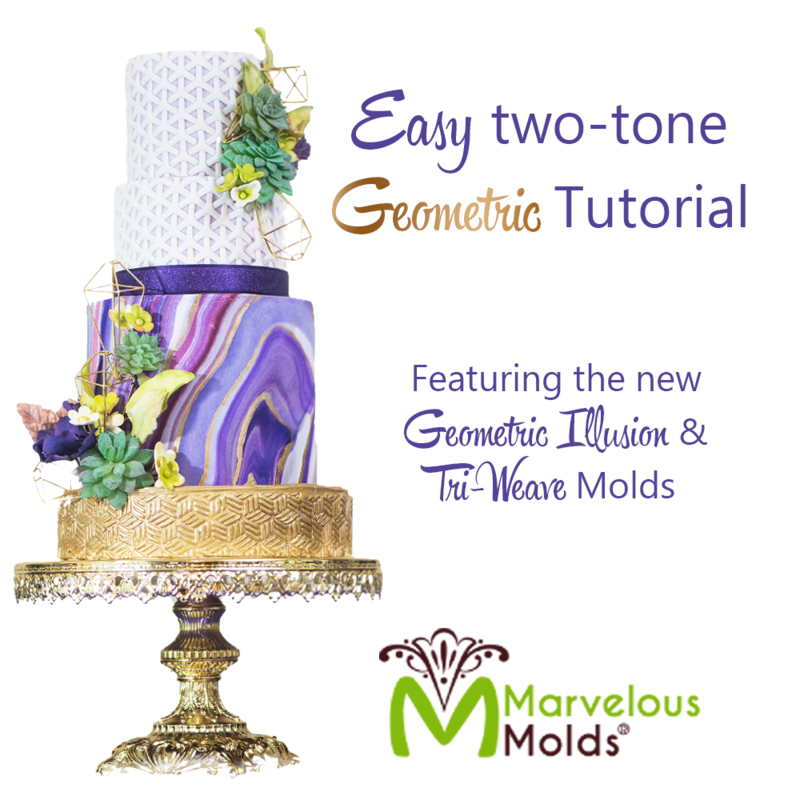 Cover the cake tier with the ombre fondant using the paneling method. Simply measure the height and circumference of the cake tier and cut a panel of fondant large enough to cover. Cover the top of the cake in the lightest shade and then unwrap the panel around the perimeter of the cake, smooth and trim. 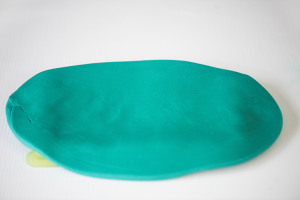 Condition 3oz of teal or green-blue fondant with a little vegetable shortening. Lightly dust the Lavish Loops mold with a little cornstarch to prevent sticking. 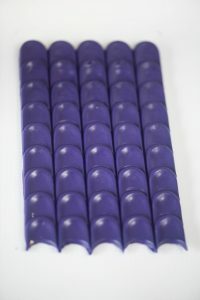 Roll the fondant to 1/4 inch thickness and place (presentation side down) into the prepared mold. 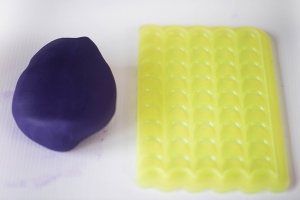 Press the fondant into the mold, making sure to fill all the crevices evenly. Roll over the mold, pressing down as you roll, this will cut away the excess fondant as the edges of the mold are sharply angled. 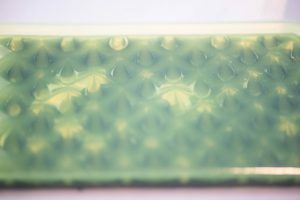 Run your fingers over the edge of the mold to clean up the edges, and flip the mold over to make sure the cavities are properly filled. 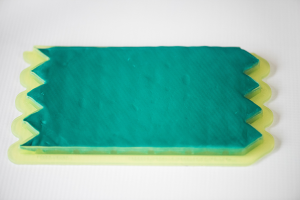 Place the mold into the refrigerator or freezer for 1-2 minutes to firm up. This will ensure a clean removal. Panel the top of the cake in the same color fondant and then line up the edge of the mold with the top of the cake and press to adhere. You can use a little edible glue if necessary. Once adhered, gently remove the mold. Continue to make panels and align them carefully with the previous section to ensure a continuous pattern on the cake tier. Condition 3oz of purple fondant with a little vegetable shortening and lightly dust the mold with cornstarch to prevent sticking. 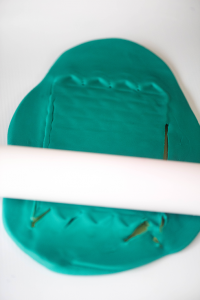 As previously, roll the fondant to 1/4 inch thickness and place into the mold. Press into the cavities and remove the excess. Place the mold into the freezer to firm up. 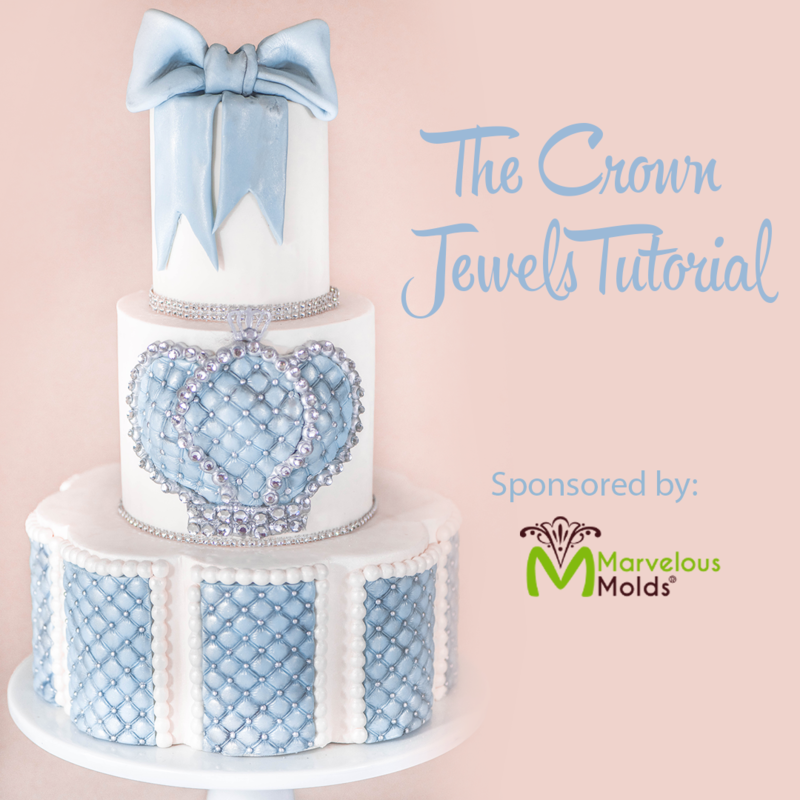 This time, we will be using the mold vertically, remove the fondant from the mold and trim to the height of the cake tier. Rebekah notes: Our cake tier was 5 inches high, so we removed one row of petals. 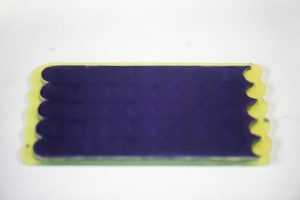 Line up the panel vertically on the cake and attach with a little edible glue. Continue to make and adhere panels to the cake, making sure to align each panel carefully for continuity. Stack and dowel the cake, and attach the flower and decorative feathers. 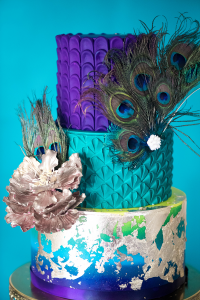 Make sure to insert the feathers into a straw or seal with food safe sealant before attaching to the cake. Rebekah notes: Use sterile, cleaned and washed crafting feathers that were not chemically treated. Lastly, add some edible gold leaf to the bottom-tier by brushing a little water or piping gel onto the tier and adding some leaves of gold. Brush with a soft fluffy brush to remove any excess. Edit: If you have concerns about using feathers on cakes, you can instead use wafer paper feathers or chocolate feathers. 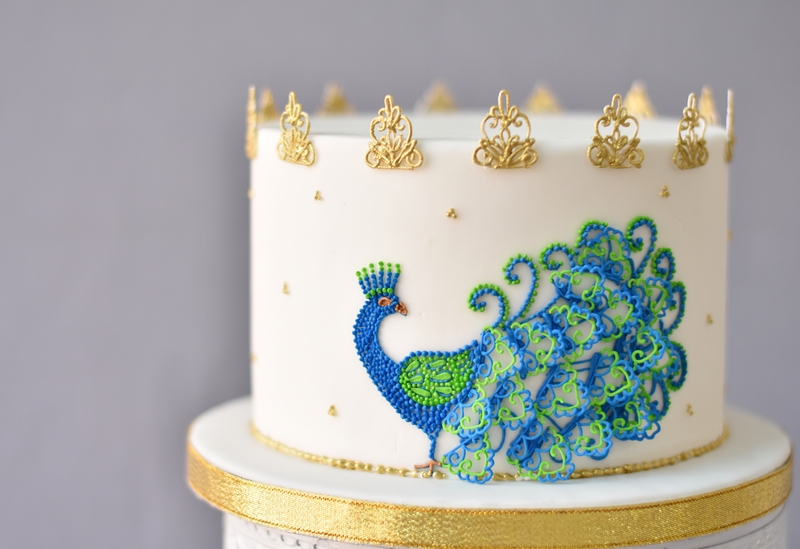 We used specially sterilized non-chemically treated feathers, that were fully sealed before being used on this cake!